Melodie "Mel" Gable reacts to the vice presidential debate on Thursday. For the 20 or so Republican women who gathered Thursday night to watch the vice presidential debate, the event was all about rooting for their candidate – and having some laughs while they were at it. Actually, a lot of laughs. 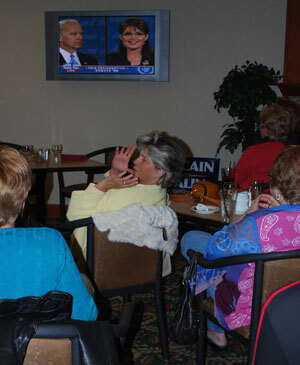 The women, who met at the Holiday Inn Hotel & Suites on Boardwalk and graciously allowed The Chronicle to join them, enthusiastically supported Sarah Palin while gleefully deriding her Democratic opponent, Joe Biden.